The Cricut DesignStudio software is an exciting way to connect your original Cricut or Cricut Expression machine to your computer! Using an on-screen cutting mat, this program allows you to explore, design, and cut the complete Cricut Cartridge Library. What You See Is What You Cut! With a user-friendly interface and the ability to save your innovative creations, you’ll discover that the Cricut DesignStudio is a must-have addition to your Cricut cutting system! 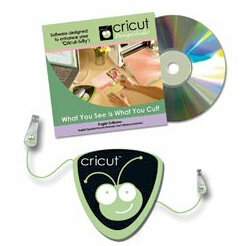 Cricut DesignStudio includes an electronic collection of every image found within the Cricut cartridge library. Simple and quick keyword searches allow you to search through the 1000s of images available to find that perfect letter, shape, or phrase that will transform your project into a new stunning creation! Bring Cricut designs to your own craft studio! By using the on-screen cutting mat, you can design your unique cutting layout by moving, reorganizing, rotating, resizing, skewing, and welding letters, shapes, and phrases from any Cricut cartridge available. Easily save your one-of-a-kind layouts for later use or to share with others! Operating System Requirements: Windows XP SP2 or Windows Vista 32-bit 800 Mhz Processor Speed 512 MB RAM 100 MB Free Hard Disk Space CD/DVD-ROM USB Port 1023 x 768 or higher display resolution settings Please note that only unopened software may be returned to us for a refund. Defective software must be returned to the manufacturer for a replacement. Do you have the Cricut Design Studio Bonus Pack Software? Let us hear your review! Do you like it?